W. H. Leary Company, a third-generation family owned organization, celebrates 90 years! 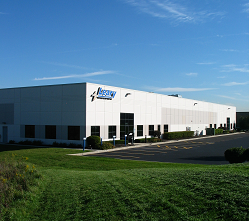 Continuing to engineer glue application, quality assurance and data collection solutions for the paperboard packaging industry, headquartered outside of Chicago, IL, USA, Leary offers a wide range of solutions to meet customer demands today and in the future. The Beginning. Leary’s beginning and true thumbprint in the folding carton industry can be traced back to their first detection solution to the industry in 1985 in response to a local carton manufacturing plant’s problem with sending their customers mixed cartons. With extensive background in sensor capabilities, electronics and monitoring, Leary presented their first barcode detection solution to Container Corporation of America in Carol Stream, IL (now Graphic Packaging International). The solution was successful and quickly expanded to include a controller that monitored for multiple detection options including glue, cello, flaps and more. This solution began to solve other mixed copy and carton quality issues for other folding carton plants. This surge in demand led Leary to begin primarily servicing the folding carton industry, making products, services and technologies to support the goal of delivering 100% Fit-for-Use cartons. Quickly after the solution began to grow in the U.S., Leary engineered automatic glue line correction software and reject tracking that continue to be the foundation of controller analytics. The growth of the company has always been based on advancing technology for the folding carton industry, partnering with each plant to offer exceptional customer service and support to their customers. "Our customers not only demand quality but your customers do as well,” has been the basis for delivering throughput-increasing solutions. This has led to Leary to gain a strong market share offering a preferred solution for U.S. multi-national packaging companies and independent carton plants. Demonstration and Training Center. Leary’s 10,000 square foot Demonstration and Training Center expands customer relationships by offering product demonstrations, system qualifications, new technology displays and off-site operator training opportunities. The Training and Demonstration Center is currently equipped with a Bobst Expertfold 110, Expertfold 165 and Kluge Omni-Fold 3000. 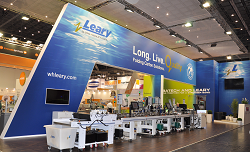 Leary’s gluing and application systems can also be seen in numerous OEM showrooms. Continued Growth. Worldwide growth has been supported by Leary European headquarters in Basildon, UK, as well as additional offices in Mexico City, Mexico and Toronto, Canada. With the need for a more localized network of sales and service, Leary entered into a partnership with Robatech Gluing Technology in 2014, an agreement that enabled the Robatech worldwide network to sell and service the Leary cold glue and quality assurance solutions. Currently, Leary is offered in over 60 countries servicing the LATAM, European, and Oceanian countries. Extensive corporate support and sales development is offered from Leary headquarters to support this growing network. Recent participation in key European and Asian OEM open houses demonstrates the need for an improved gluing & quality assurance supplier that offers technologically advanced solutions with dedicated service and support. Leary’s message at drupa 2016, Long. Live. Quality., has been at Leary’s core since the first quality assurance solution and will remain at the forefront as Leary continues to provide market demanding products and value-added solutions for folding carton plants worldwide.